As big fans of agricole rhum, we know that Rhum Fest Paris is a rum event where there’ll be lots of new releases and rums we’ll never hear about in the UK. We attended the Saturday and Sunday public sessions, as well as half of Monday’s trade day. An ill-thought out afternoon Eurostar meant we left with some rhums on the hitlist still untried! It’s our second Rhum Fest Paris, the first time we were there as part of the general rum crowd. We were lucky this time (thanks to Cyrille & Chloé) to have been able to go as rum bloggers, which meant we could skip the long queue and be officially recognised, and best of all, we got to try some ‘under the table’ rums! It’s a busy couple of days, both in terms of making it through all the stands you want to and the number of people. Some stands were three people deep for the duration so had to be the first port of call on the (slightly) quieter trade day. With literally hundreds of r(h)ums (about 95% agricole!) on offer, we’ve picked out the new releases and existing must-tries that really exemplify how agricole rhum differs from the molasses-based rums that dominate the market in the UK. Longueteau was one of the first stands we visited, staffed by our friend Jessica Toumson of Rumantics, and passionate fan of Longueteau. We were lucky enough to visit the distillery and Jessica on our trip to Guadeloupe last year so it was a great opportunity to catch up and sample what had been in the making when we visited. We’d seen the Harmonie range trailed in the weeks before Rhum Fest, but this was its first public appearance – a range of three expressions that are each a blend of single casks brought together like the musical notes to create a harmony. As with most of the Longueteau rhums, the base is 65% red cane and 35% blue cane. The three are Prélude (technically an amber rhum, and aged ~3 years on new oak barrels, bottled at 50.3%), Symphonie and Concerto (49.2% and 47.2% respectively, and both a blend of new and ex-cognac barrels). All three are limited to 1,400 bottles. Concerto, at the highest price point, was the lighter of the three and selected for a sweeter finish, but Prélude really stood out for an amber, with complex flavours and a long finish with a bite. Symphonie was also a great rhum – a saline nose but a hint of sweetness in the mouth. Also on the Longueteau stand were the 2017 vintages of the Sélection Parcellaire, each produced from an individual parcel of land on the estate. This is why agricole is so interesting, as different characteristics of the land (full sun, shade, red cane or blue cane, close to the sea, and so on) result in a completely different taste. And the famous Genesis was also there. It’s a brut de colonne – straight off the column , at 73.5% and rested for 24 months in stainless steel. This seems to be the key as it is so smooth at the front of the mouth and gains its strength as it goes down. The second sip is as smooth as you like. Crossing over to Martinique, we got our first opportunity to work through the full range of HSE cask finishes: Château La Tour Blanche Sauternes, Oloroso, PX, Porto, Château Marquis de Terme Bordeaux, and Highland and Islay whisky. The only ones we didn’t like were the whisky ones. We’re not fans of whisky to start with and the full-on peatiness of the Islay finish was rather offputting! La Favorite was one of those stands we couldn’t get to until first thing on the Monday session. We were keen to try the full range as it’s a brand we have barely come across, probably as it’s one of the last family-owned distilleries on Martinique and doesn’t have the same marketing and distribution power as some of the others. A monovarietal single vintage, Bel Air red cane 2017 here, will always draw us in though! And so good we bought a bottle. Coeur de Canne was also impressive. It’s a blend of four cane types – blue, red, pink and grey – and has a longer fermentation, we wished we brought one back! The aged expressions are probably a good introduction to rum for the whisky drinkers, as they are quite woody and dry. Rhum Depaz, for which our friend Benoit is the new brand ambassador, was also a busy one. They had a new launch: the Brut de Fut 2000 (cask strength, single barrel) and was one of those that’s a good mix of dried fruit and tannins without too much woodiness. It’s 58.5%, bottled in February, but unlikely to make it over to the UK. We’re likely to get a different cask later in the year. 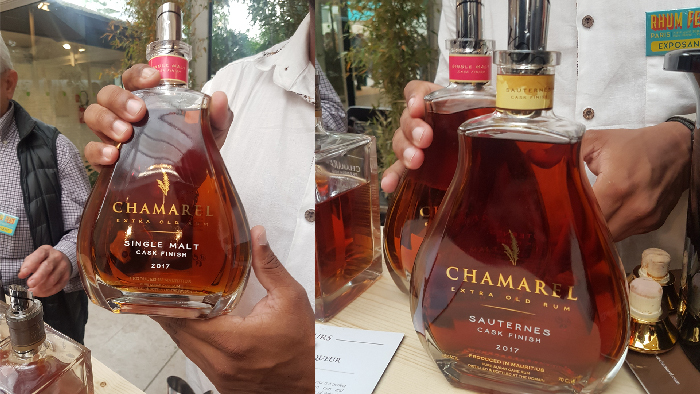 We had the pleasure to meet Ludovic, the Chamarel brand ambassador who made a special trip to Paris from Mauritius for Rhum Fest. He introduced us to their range, which we were a bit familiar with, as we had visited the distillery a few years ago while on holiday. We are fans of the range, and the new, very limited release of the cask finishes was a nice surprise. The Single Malt finish is a blend of rums aged for one year in ex Macallan and Glengoyne whisky casks. Their double pot distilled white agricole rhum was also very pleasant, and one that we need to add to our collection. Of course we get some of the French Caribbean rhums over here in the UK, but less so of the rhums from Réunion and French Polynesia. And finally, La Maison du Whisky had some special editions. We were lucky to try the Casimir clairin aged for 27 months in ex-whisky barrels (pleasingly, the flavours of clairin remain dominant). Knowing that Luca Gargano is busy bottling great rums, what would be the best way to use some ex-Caroni casks? Well, what about a Vaval clairin aged in ex-Caroni casks, which we were lucky to try. Thank you Luca for this invention! There were plenty more great r(h)ums that we have tried such as the new Admiral Rodney releases from St Lucia Distillers, Velier & Foursquare Triptych, and some of the r(hums) from Bougainville, Transcontinental and Neisson range. This was another great Rhum Fest Paris, with an even greater selection of rhums! See you next year!